This past weekend, I put away the last of our holiday decorations, and along with them, my “eat whatever you want, it’s Christmas” outlook. It’s back to fresh juices and bootcamp for me. But, of course, I can’t do away with all snacking. 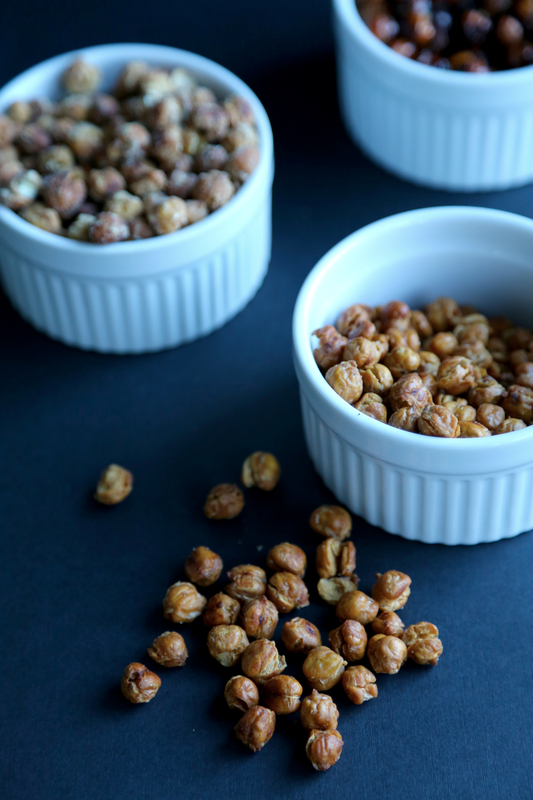 My friend Christine introduced me to toasted chickpeas and I can’t stop eating them. They’re a so easy to make and delicious, you forget that they’re just toasted beans. And the flavor possibilities seem virtually endless. I’ve been experimenting with whatever herbs and spices sound interesting, and here are three of my favorites so far. Happy (healthy) snacking! Drain chickpeas and dry well with paper towel. Remove the shells as much as possible. Lay out chickpeas on a baking sheet in one single layer. I do this 1 can per baking sheet, but you can toast all at once as long as space allows. Make sure the chickpeas are in one single layer to ensure even toasting. Sprinkle 1 tablespoon of olive oil and a hefty pinch of salt over chickpeas, toss to coat. Repeat for each batch. Bake for about 55 minutes or until crispy. Season right out of the oven. For dry seasonings, sprinkle amounts as desired 1/2 tablespoon at a time. For wet seasoning, mix honey and lemon juice in a separate bowl. Pour mixture over chickpeas straight out of the oven and toss with chili powder until well coated. Bake 10 minutes more or until moisture is absorbed. What a great idea! I can’t wait to try these. Thanks, Katie. I hope you enjoy! Cate, they’re pretty tasty. I love that you can dress them any way you want. And it’s such an inexpensive healthy snack. Agree! I will definitely be giving them a try (particularly given my current “detox” mode). Thanks for the recipe! Looks like an awesome alternative to my usual snacks! Can’t wait to try these– I love Old Bay and I love chickpeas, so it’s a win/win. Thanks! such a great idea – i’m making these tonight! Definitely going to try this out at home! Looks delicious! I’ve never cooked with garam masala, I’ll definitely give it a try. Thanks! And happy new year to the Gershon family! Hope you’re all well. Hello to Adam! Hope these are in my stocking next Christmas!! Oh man, I hope I (I mean Santa) remembers! Thank you for sharing. I never thought of using chickpeas as a snack. I should also use it more often since it’s also the name of my website. Ha! Yeah a couple of chickpea recipes are definitely in order with a blog name like that! love me some chickpeas!!! never thought of seasoning and baking them! I never did either, until my friend clued me in. They’re so good and easy to make! definitely will be trying this!! i’ve loved me some chickpeas since day one!! Thanks so much for your kind comment. And congratulations on the prospect of starting your own blog! It’s really fun. I wold definitely recommend starting with a free (or cheap) platform. I started with a free theme from WordPress.com and eventually switched to a paid theme that is hosted by an outside host via WordPress.org. After a few years, I realized I needed more freedom and space and the.org version satisfied those needs. Even with the preset themes, there is still room for customization so you’ll be able to make a free WordPress blog your own. I hope this helps!